This entry was posted on March 7, 2010, 3:14 pm and is filed under During Battle, Trinkets, War Context. You can follow any responses to this entry through RSS 2.0. You can leave a response, or trackback from your own site. 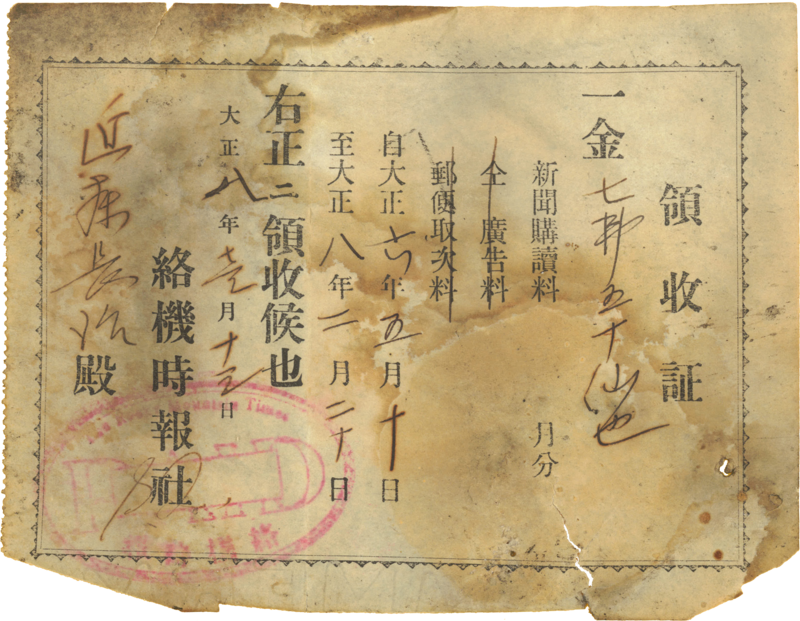 This is a receipt in the amount of $7.50 for a subscription for the period May 10, 7th yearof Tasho (1918) until February 20, 8th year of Taisho (1919). It seems the receipt was issued on December(?) 13, 8th year of Taisho but I can’t read it clearly. Thank you! Now, I’m afraid it poses more questions than it answers. I don’t know why my grandfather would have this when he served 30 years later. It doesn’t seem to be a worthwhile trinket to sell in a market. I’ll never know, I suppose.